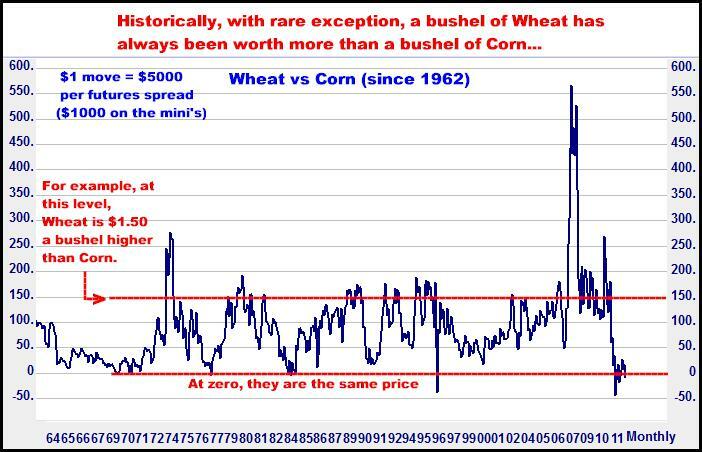 To put it mildly, it is rare that Wheat and Corn are priced the same…I think the next move on this chart will be decidedly up, to at least the 150 area. I may be dead, dead wrong, but I will tell you this: Virtually EVERYBODY in the trading world is (and has been) roaring bullish on old crop, or July, 2012 Corn. 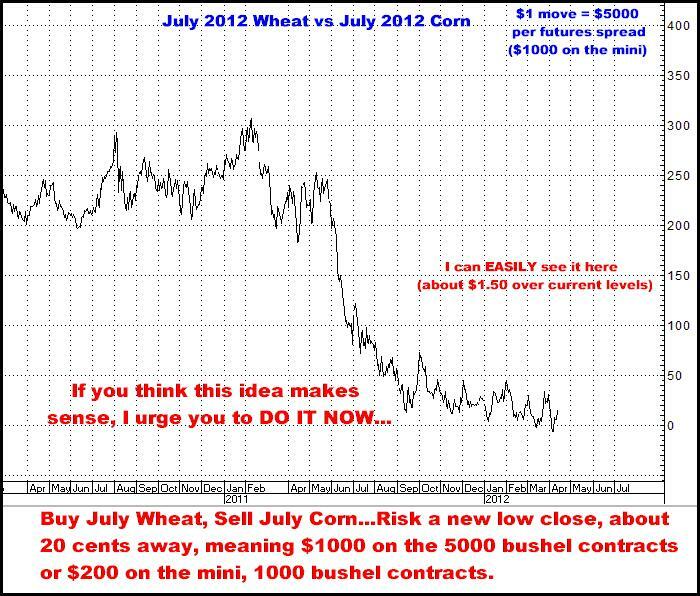 In fact, this afternoon I asked the best living, breathing fundamental expert I know, “ Is ANYBODY bearish July Corn”. The answer was a big “NO”. Get this straight…In my opinion: Regarding Corn, farmers are bullish (and holding a LOT of it). Traders are bullish. Funds are bullish. Everybody is bullish…and they ALL HAVE BEEN BULLISH since last summer, even though the market has come down $2.00 while they all keep talking the same STALE and probably totally-accounted-for-in-the-market (long ago) story of “tight supplies”….Meanwhile, probably the biggest Corn crop in history may be harvested around the globe next fall and winter. Also, regarding the Wheat side of this equation, my guy points out that both Japan and China, last week, were making major purchases of Wheat as feed for their livestock, which is NOT the norm…but with Corn and Wheat trading at roughly the same price, this is something of a no brainer…The significance of this is, Wheat is not usually purchased as a feed ingredient…and when this DOES start happening, especially when it is coming from two of the world’s major feed importers, you are potentially changing the basic supply-demand equation of the Wheat market, in a BIG way. Beyond those fundamental observations, as I have noted in previous newsletters, Speculative traders currently have been holding the biggest Short Wheat position EVER, while Commercial traders have the biggest long position EVER…While this does not mean this trade automatically will be a winner, I still like the odds. This is a futures trade only…If you can see the possibilities here, but maybe don’t understand the concept of how a spread works (Buying July Wheat, Selling July Corn), give me a call and I’m sure I can clarify it for you. 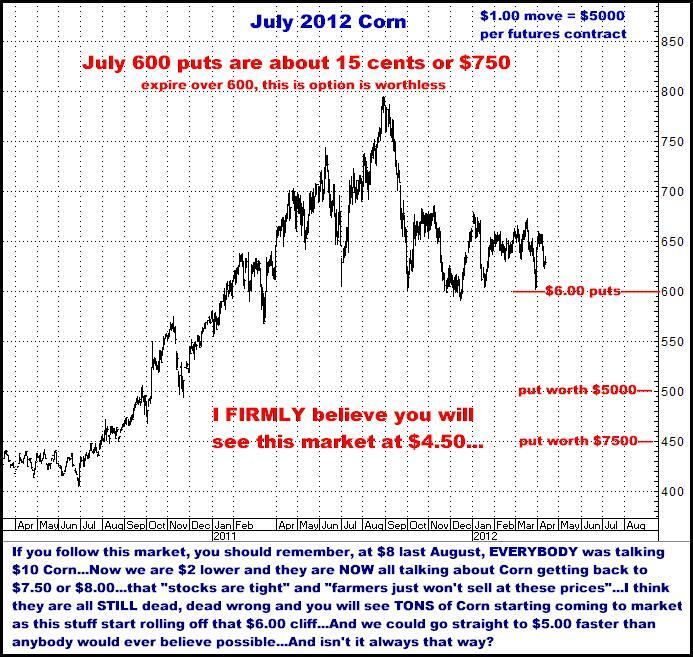 IF YOU KNOW ANYTHING ABOUT THE CORN MARKET, I CHALLENGE YOU TO FIND MORE THAN A FEW VERY RARE “IDIOTS” LIKE MYSELF WHO ARE BEARISH JULY CORN (I honestly have seen none)…and when you DO realize all the opinion IS totally one way, ask yourself what this has seemingly always meant in the past…I don’t give a hoot what the numbers are (exports, supply, etc. ), what does it usually mean when NOBODY is expecting to see a market go down? And to be clear, I’m not talking September or December (new crop). I am talking old crop, July Corn. I am STILL buying…especially NOW. 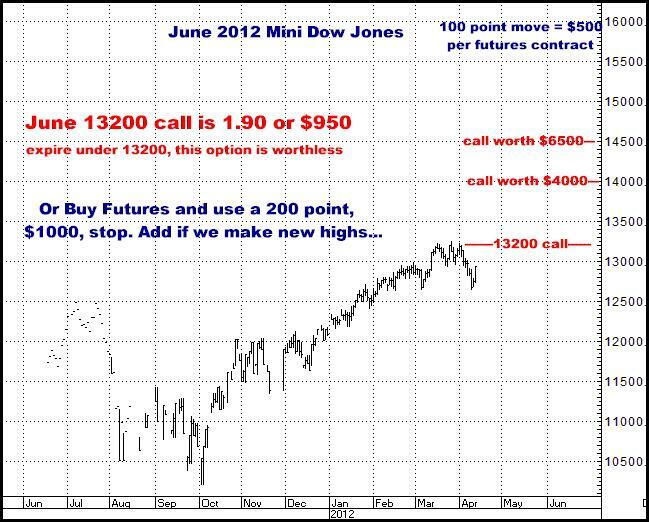 I believe the recent set back has set the stage for a BLISTERINGLY STRAIGHT UP RALLY that will have everybody jumping all over themselves to FINALLY buy when we have crossed through 14500 or 15000 on the Dow...I HONESTLY BELIEVE THIS IS A STRONG, STRONG POSSIBILITY RIGHT NOW...All the malarkey about "only" creating 120,000 jobs last month, and Eurofears (AGAIN??? How many times will people bite...be scared into selling...on the absurd idea Europe is going under? ), are just that... Malarkey, or psychological BS that keeps the masses thinking, "Don't buy stocks here! "...The world economy is NOT slowing...On the contrary, business is TAKING OFF all over the planet. BUY THE STOCK MARKET NOW. Bond traders, as I am forever pointing out, are a world of sheep. Generally, they are, by nature, quite conservative and only jump when they sense everybody else thinks they same way they do...which can be deadly in the markets...I see the recent 4 point rally following last Friday's "disappointing" jobs number as an excellent example of the sheep crowd buying into the absurd, never ceasing, but wrongful notion, the economy is on weak legs...So they all bought Bonds in the few days following the unemployment report. 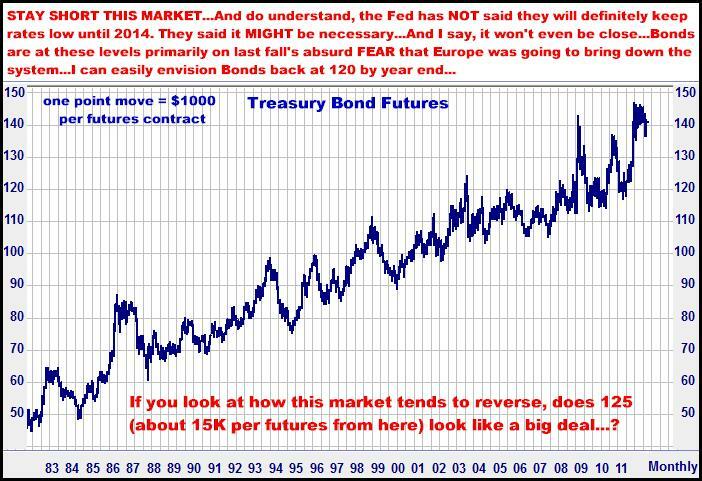 I continue to think this market is on the verge of a collapse…and anyone who buys Treasuries at these levels (and a LOT of people have during the past 6-8 months) will end up losing money. Not only will their 2-3% yield be eaten up by inflation, but aside from the taxes they pay on the interest earned, they will quickly be holding 10-15% losses on their principal. 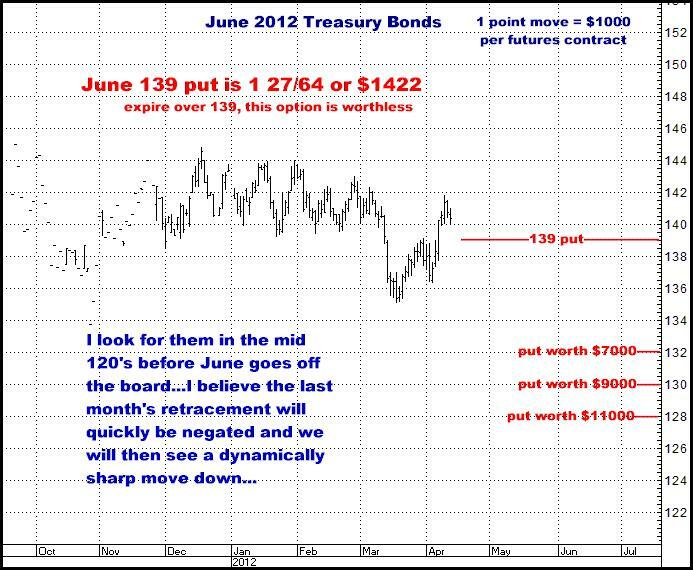 To me, Bonds are not at investment at current levels. I continue to recommend being short this market and continue to look for the mid 120’s before the June contract goes off the board. That’s enough for the afternoon…I still remain a buyer in Cattle, buyer in the Eurocurrency, and Short Unleaded Gas. I will maybe cover them tomorrow or this weekend. Pick up the phone…I really think these are some STRONG ideas.